I love decorating with vintage pieces. 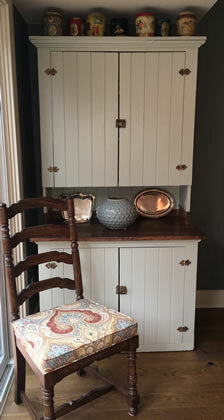 Whether it is an antique table passed down through the generations or a unique treasure found at a flea market, vintage and antique items will surely add a sense of warmth to your room. My collection is vast and varied. If I love it, I buy it and then I find a special place for it in my home. The difference between antique and vintage depends on the age of the piece. Anything over 20 years old is considered vintage. Pieces older than 100 years are antiques. If you watch the show Fixer Upper, you know that using vintage and/or antique pieces in your decor is making a huge comeback. There’s nothing like the patina and character that antiques and vintage bring to create a feeling of comfort to a home. With the busyness of life, it’s nice to make your home a place of refuge. Vintage decor takes us back to a simpler time. It brings a feeling of comfort. Many times it brings back fond childhood memories. Plus, vintage helps you bring new life to old things. It’s wonderful to take antique things and give them a place in your home. Decorating with antiques and vintage can cost a fraction of what it costs to deck out your house with new furnishings. It’s a kind of hobby where once you get hooked, you will experience a big thrill when you discover a new piece. Part of the fun of decorating with vintage is the hunt to find pieces. Just as it’s fun to collect treasures when you are on vacation, you can look for antique pieces to add to your home. You can spot hidden gems at garage sales, resale shops and even in Grandma’s attic. You can also find vintage decor on ebay, Etsy, Amazon, and other various online stores. During the summer you can score antiques at flea markets and swap meets. Keep your eyes peeled and you’ll be surprised at what you can find. 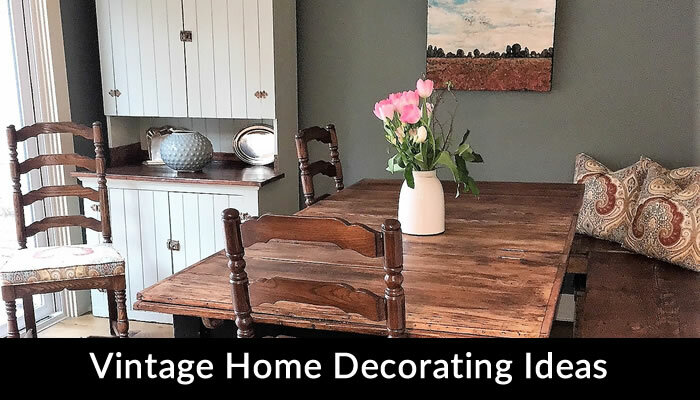 Want to give your home a vintage look and feel? 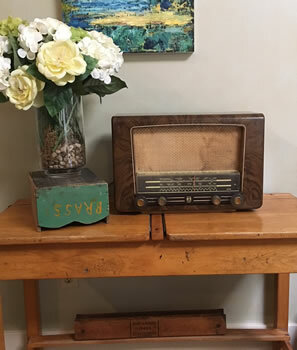 Here are some simple ways to add some vintage flair to your living space. Have fun mixing in vintage or antique pieces with brand new items. For example: A brand new, clean-line sectional would look fabulous with an antique wagon turned coffee table. 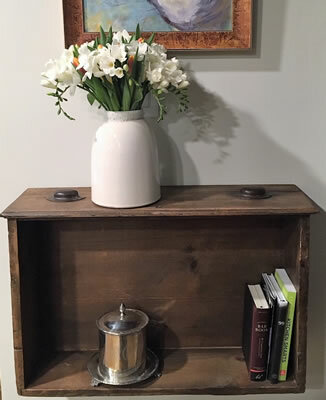 A drawer from an old desk mounted onto the wall makes for a unique entry hall table. Group them together to create shelves for storing wine glasses or books. Vintage candy tins or cheese boxes make great storage for keys, potted plants, etc. Some people like to accent their spaces with vintage treasures. Others go “all out” and give their whole living space an antique feel. Whatever you choose, the patina and charm of these new found treasures will surely bring warmth, character and nostalgia to your home. So what items should you keep your eye out for? old appliances: radios, clocks, shake makers, etc. Enjoy finding unique and beautiful pieces to make your home have that nostalgic warmth of vintage style. And if you need a professional to match your décor with all of your collectibles, contact me for a design consultation if you live in the North Vancouver area of BC.